Enterprise Resource Planning - ERP - Secure Website Hosting Software Development SSL as the infrastructure of automation and data tools, set it, forget it and get back to working on your business. Powerful, Secure Website Hosting and Application Development tools are available with quick self-setup or rapid development by us. Enterprise Resource Planning (ERP) system is a business process and information management software system that organizations can use to integrate and automate data activity in areas such as planning, purchasing, inventory marketing, sales, finance, human resources and more within a back office. Most Open Source software is free to use and customize. Be sure to identify cost and features when selecting any software solution. With a Grow It OnlineTM Secure Website Hosting plan, you can easily install any of the ERP software solutions listed below with a few clicks. It's all included with your secure website hosting plans from Grow It OnlineTM. Grow It OnlineTM Secure Website Hosting Customers simply visit their cPanel online, select the program you wish to use, install it and then the fun begins. At this point, you and your team of authorized personnel dive in and populate the system with your business information. Or hire a Grow It OnlineTM Web Attendant to put the wind in the sails to launch! Easily setup your business in a secure environment to manage and protect your data. You may either easily install and manage any of these powerful ERP systems, or hire us to install and manage with you as long as you need. Click a Tab above to learn a bit about some of the ERP Software available with GrowItOnline.com Secure Website Hosting and Secure App Hosting solutions. You select a Secure Website Hosting plan, access your cPanel administration area, select the program, install, and get to work. No Licenses. No Fees. No Limitations. Flexible and efficient management for your company wherever you are in the world - this is what you gain by installing YetiForce. Where? Anywhere - on your computer, tablet, or smartphone with access to the Internet. YetiForce is an open source application that is constantly being improved by us and our community, to help you run your company. Efficiency, control, multitasking, innovation is what YetiForce can offer. YetiForce is an open high-class CRM (Customer Relationship Management) system that helps to manage relations with customers, suppliers, partners and staff. It's an open, innovative and complex system that has become the key to efficient management within a company. YetiForce can be easily enriched with add-ons. You can also modify its code as needed and keep it to yourself - no need to show it to anyone. It was created so you could achieve the impossible with your business. 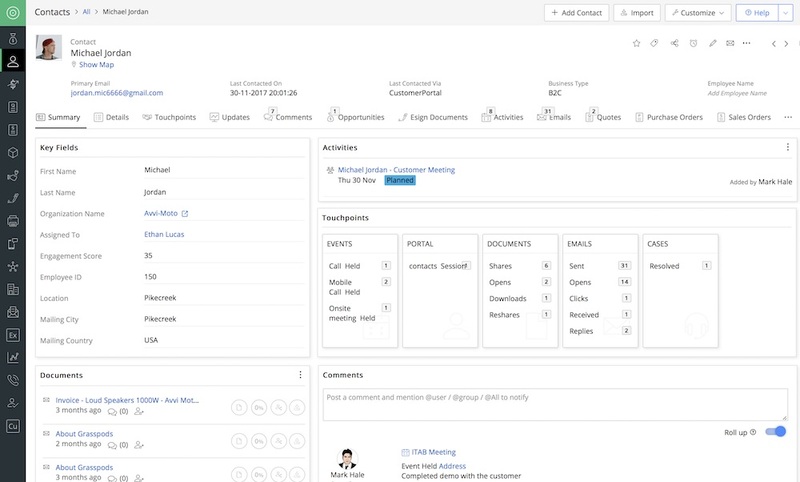 An enterprise CRM and collaboration tool. Share projects, calendars, files and e-mail online with co-workers and clients. Easy to use and fully customizable. There is a Professional version available, too, at about $400 to purchase full suite of modules, full license. Is a full-featured CRM software ideal for small and medium businesses, with low-cost product support available to production users that need reliable support. Vtiger CRM helps you bring the full potential to life in marketing, sales, and overall customer service. is the world's leading provider of commercial open source customer relationship management (CRM) software. Founded as an open source project in 2004, SugarCRM applications have been downloaded over five million times and currently serve over 500,000 users in 75 languages. Features include: Core Sales & Marketing, Dashboards, Reporting, Access Control by Team, Workflow, Sales Forecasting, Customer Portal, Web To Lead Forms, Lead Management, Marketing Analytics, Support and Collaboration, Customer Profiles, And Much More! EPESI is a web application for managing business information. It makes data organizing and sharing easy, simplifies internal communication and makes workflow more efficient. Zurmo is an Open Source Customer Relationship Management (CRM) application that is mobile, social, and gamified. We use a test-driven methodology for building every part of the application.